Robots and mankind. When will we ever learn to work together? Apparently not any time in the near future because on June 5th 2084 robots have taken over the earth and are bent on destroying the last surviving human family! However they're going to have to get through you first, for you are the only human left who can take them on. Armed only with your trusty anti-robot laser gun (snicker..), you must save humanity from the endless hordes of Robotrons. Robotron is unique among 5200 games as it one of only two games that uses the dual joystick holder (Space Dungeon is the other). This holder allows you to place two 5200 joysticks into large plastic slots that hold the sticks in place. With the joysticks firmly secured you can place the unit on your lap or a table and move each stick with a separate hand. This setup mimics the two joystick control scheme found in several popular arcade games, and it works quite well. In Robotron one joystick is used to move while the other is used to fire. The dual joystick arrangement allows you to move one direction and fire in another. Of course you can still play Robotron with one joystick, but you will be limited to firing in the direction you're moving (not a good thing in Robotron). 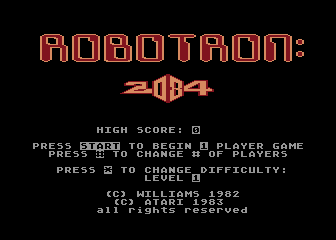 Robotron 2084 has long been a favorite of gamers due to its non-stop action and high difficulty level. Each wave takes place in a large open arena and starts with your character in the center of a large horde of enemies. 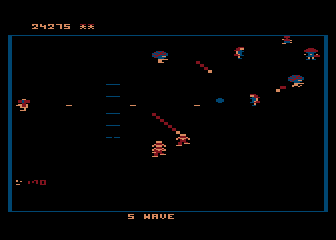 The trick to mastering Robotron is to learn how to successfully blast a hole in the enemy horde and make your way towards one side of the screen before the ring of enemies collapses in on you. Of course this is much easier said than done as there are whole slew of different enemies that react differently to your actions. These are the standard enemy in Robotron. These mindless grunts will make a beeline towards you no matter where you are. The longer the level lasts the faster Grunts get, so take them out before they gain speed. Also known as Box Droids, Hulks have one purpose in life, to destroy the last human family. These large square robots are indestructible, so your shots only bounce them back slightly. The best way to handle Hulks is to stay out of their way! Brains only appear every five waves on what is commonly known as the "Brain Wave". These ugly blue robots shoot out deadly fireballs that will chase you around the screen. Brains also have the power to reprogram humans into Progs. Progs basically human projectiles that move around the screen at astounding speeds trying to hit you. Take them down with a well-timed shot. Spheroids (also known as Cheerio's) are the absolute deadliest enemy in the game. Although not normally deadly themselves (although they are easy to run into), Spheroids move around the screen at high speed trying to get away from your shots. After a few seconds each Spheroid will launch three Enforcer Embryos, which will grow up into Enforcers unless destroyed immediately. Make shooting Spheroids your number one priority at the start of each level. These strange box shaped robots are similar to Spheroids, but tend to move in a more erratic pattern. Quarks will turn into deadly Tanks unless destroyed quickly. Thankfully each Quark can only make one Tank. Tanks resemble those square red wind-up robots that were popular in the 60's and 70's. However unlike the toy robots, these throw deadly bouncing bombs! Woe to the player who lets more than few tanks survive, as the screen will soon be filled with deadly bouncing bombs making survival near impossible. These odd shapes appear randomly around the screen and don't move. Electrodes are only deadly if you're stupid enough to run into them, so make sure you shoot them out of your way. Although it's not a bad version of Robotron, the 5200 could have done better. The whole game suffers from a low framerate that makes everything look like it's jumping around the screen rather than walking (especially if there are alot of objects on the screen). The sleek graphics from the arcade have mysteriously turned very blocky looking, and the dark colors make the game look very dingy. However with the aid of the dual joystick holder this average game begins to pick up a bit and can actually be fun if given a chance. However if you've got the 7800 version handy, you'll never want to look at this version again.